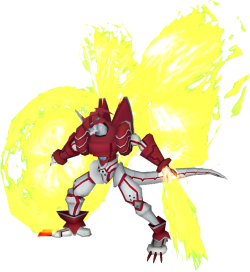 ShineGreymon (Burst Mode) is a Light Dragon Digimon whose name and design are derived from "Shine Greymon", it is also a pun on "rise and shine". It is a ShineGreymon that has temporarily reached the limits of its abilities through Burst Digivolution, and wears an aura of solar-class high-energy flames. Combines the shield and sword of fire to create a giant fire sword. Concentrates all your power to create a huge explosion.